This was my holiday from hell and the whole place need fumigating and shutting down. There were pubic hair in the bath room no shower curtains let alone any toilet rolls and go forbid you should want clean towels. the price me and my partner paid was alot for what we got and when we complianed they only moved after paying a further 180 euros. Not recommended if you like clean towels and beds and if you like to wash.
suitable for teenagers who just want to get drunk. For the price we paid, the accommodation was really quite good. The rooms were very basic, but we didn;t really expect much else! It's right on the beach and at the end of 'bar street'. A very central location. There were two minor complaints that we had. Firstly the German guy who runs the place thinks that all young people represent a 'noise' problems (even if you are not really being noisey!) My advice is to keep quiet around the hotel and ignore him! 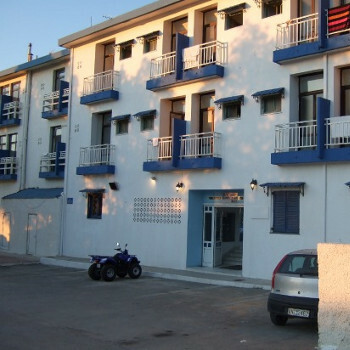 Secondly, the hotel is at the end of the main road through Malia. This means that the mopeds all turn around here to head back up the street after cruising. It was abit noisey with the windows open (they needed to be with the heat!) However, if you're out all night as I suspect you might be, then this won't bother you too much. I actually went here in 2001 but they wouldn;t let me choose that option in the bit above. It may be very different now! Malia, great for young groups of people but I don't think I'd return now.